View More In Keepsake Rattles. GUND knows it's never too early to start making new friends - My First Dolly is a 7" plush rattle that features an adorable embroidered pink shirt with lace accents and polka dot sleeves. 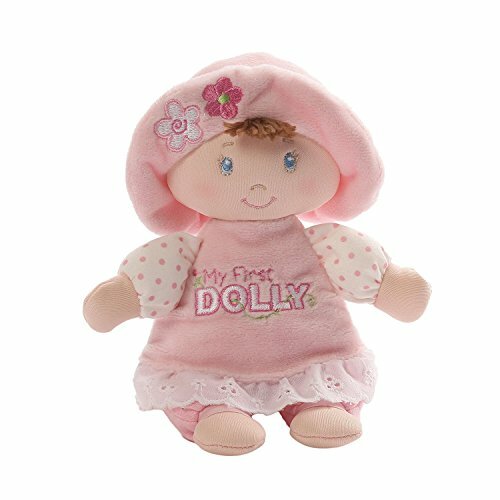 This My First Dolly also has brown hair and a floppy pink hat decorated with flowers. The words "My First Dolly" are embroidered on the dress. Your child's safety is our top concern, so all babyGUND products feature embroidered details. Machine-washable. Appropriate for all ages. About GUND: For more than 100 years, GUND has been a premier plush company recognized worldwide for quality innovative products. Building upon our award-winning and beloved plush designs, we continue to practice innovation by constantly developing new original and licensed designs to appeal to the next generation of customers. To that end, each one of our plush toys is constructed from premium materials for unparalleled softness and huggability. If you have any questions about this product by GUND, contact us by completing and submitting the form below. If you are looking for a specif part number, please include it with your message.